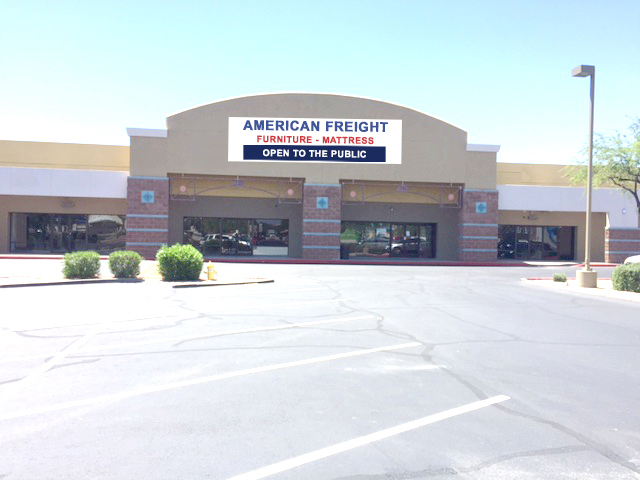 Bell Tower Village, Glendale, Ariz.
PHOENIX, ARIZONA (July 5, 2017): NAI Horizon negotiated a long-term retail lease on behalf of the landlord for American Freight Furniture at Bell Tower Village, 4913 W. Bell Rd., in Glendale, Ariz. The NAI Horizon retail properties team of Senior Vice Presidents Chris Gerow, Shelby Tworek and Gabe Ortega and Associate Patrick Anthon represented New Bell Tower, LLC, of Greenwood, Colo., in the transaction that totaled $1.266 million. American Freight Furniture, a discount furniture and mattress retailer, will occupy 25,700 square feet at Bell Tower Village. Anchors at the neighborhood center include Walgreen’s, Harbor Freight Tools, and Planet Fitness. “The new owners have been investing a substantial amount of money to rehab this center,” Tworek said. “The vision of the center was to take the failed restaurant concept and then combine the adjoining vacant space to create a mini-major space which was the original design of the shopping center. “We were fortunate to come to terms with a furniture store that has 140 locations nationwide. That will help generate additional traffic into the shopping center and benefit co-tenants as well as the neighborhood,” Tworek said. The tenant, American Freight of Tennessee, LLC, is from Delaware, Ohio.